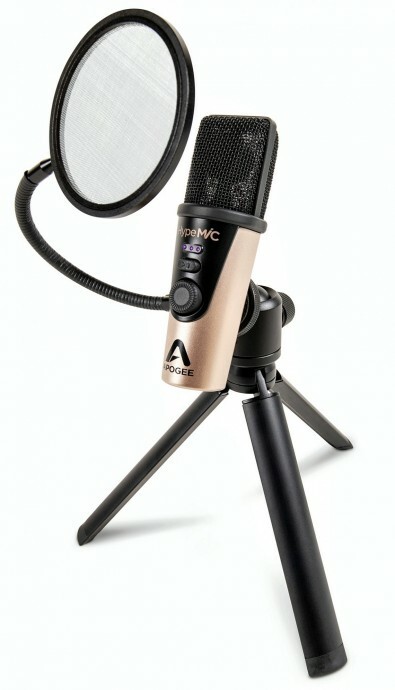 Apogee has introduced HypeMiC, a next-generation studio-quality portable USB condenser microphone with built-in analog compressor. 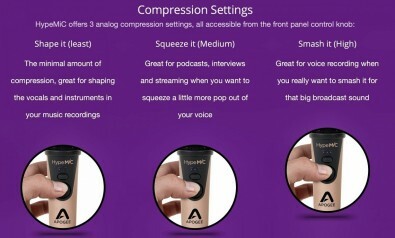 Apogee said HypeMiC’s easy-to-use compression mode brings recording studio magic to voice-overs, vocals, acoustic instruments, percussion and podcasts. The compression feature makes pro recording fast and easy, reducing the need for extensive processing and mixing after the recording. HypeMiC also features the same sound quality and headphone output features found in Apogee’s MiC+. And with HypeMiC users get accessory upgrades like a premium desktop stand, custom pop filter and carrying case as well as all the cables needed to connect HypeMiC to any iOS device, Mac or PC. HypeMiC features a studio-quality analog compressor, a PureDIGITAL connection for pristine sound quality up to 24-bit/96kHz, a premium cardioid condenser microphone capsule, headphone output with Blend feature offers zero latency recording and a premium accessories kit that includes a tripod, pop filter and carrying case. HypeMiC works with iOS, Mac and PC. No configuration is required, just plug in and record with any audio app. It is available now at Apogee dealers worldwide and Apple retail stores beginning in April, 2019. The price is $349.00.